The latest edition of Scrabble , the classic family word game gets an innovative new twist: instead of all players sharing one board, each player gets their own board. In Scrabble Me, players build words simultaneously on their individual boards, and after each round, players have the option to choose a replacement letter from the bag or select one of the face-up tiles on the prize tile podium. Another new feature is the wild tile. Each time a wild tile is played, the player who utilizes the tile must swap boards with an opponent, perhaps thwarting their strategy and turning the tide of the game in your direction! When all 100 tiles have run out, the game is over and the player with the highest score wins. 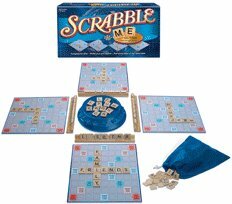 Scrabble Me is the most innovative and fun way to play Scrabble since the original! Note: This is an archive post; it was originally published on March 17, 2008.